The Chinese zodiac compatibility between the rooster and monkey seems to be pretty unique. They both are opposite of one another. Will the opposites cause too many differences? Can they find a way to overcome any issues that might arise? Will the opposite natures of the rooster and monkey in love work together to make them a stronger couple? The rooster is frequently found demanding perfection of others. They see the world in a detail-oriented way and think that there are always ways to make things better. On the other hand, the monkey dominates by being as loud as they can be. They will take more chances and will try to draw attention so that they are more likely to stand out in a crowd. Both the rooster and the monkey soulmates will want to control the relationship. However, they will want to control it in different ways. These two Chinese astrology signs are so different that for them to have a happy relationship might just not seem possible. But as they say opposites attract! So you never know! The rooster and monkey relationship can be weird and strange. They are likely to make a connection in a social setting. The rooster will be happy to get out of the house and they are very receptive to flattering comments. Their romance when they are dating, will have a pretty short blissful phase. Eventually the rooster will start demanding the monkey change. They have trouble refraining from this kind of demanding behavior anyway. They will bug them to stop partying so much, to stop disregarding their health, to stay home more, to go to bed early, and a host of other things. The monkey man or woman by nature is curious and outgoing and will always have a chance of cheating on their partner. They might start seeing less and less of their partner ultimately leading to a breakup. In a rooster and monkey marriage, they are going to be more prone to demanding and criticizing. In bed, these two animal signs will try to dominate each other and sexually demand more from their partner. This relationship could be a tough one. The rooster man or woman finds the monkey’s ridiculous ways ridiculous and thinks it is too much. Consequently, the monkey thinks their lover is lacking in a sense of fun. The controlling aspect of both the Chinese personalities could make these two argue quite a bit. In the rooster and monkey friendship, both want their achievements recognized. The monkey likes to get their work done with as little trouble as possible. They are known for being resourceful and unique. The male or female rooster is very good at being efficient, but is also demanding at the same time. With the rooster seeing so much room for improvement in the male or female monkey, they will have a hard time not pointing out what they see as the negative aspects of their partner. Both the rooster-monkey soulmates will dislike the up and down pattern in this love compatibility. They will both need to stop being egotistical and try to find a way to take the middle road. The best bet for the Chinese rooster monkey compatibility to work out is finding common ground to strive for together. This will make them want to work together. There is a chance otherwise that these two could end up arguing a lot and breakup. 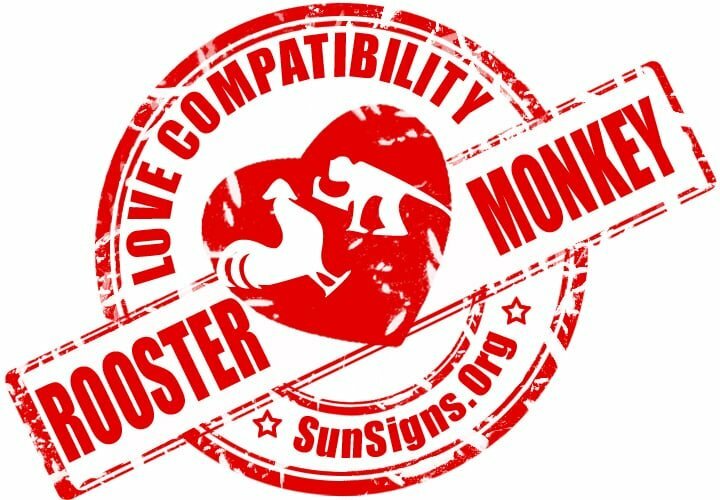 Rooster & Monkey Chinese Horoscope Compatibility Monkey rated 3 Hearts!